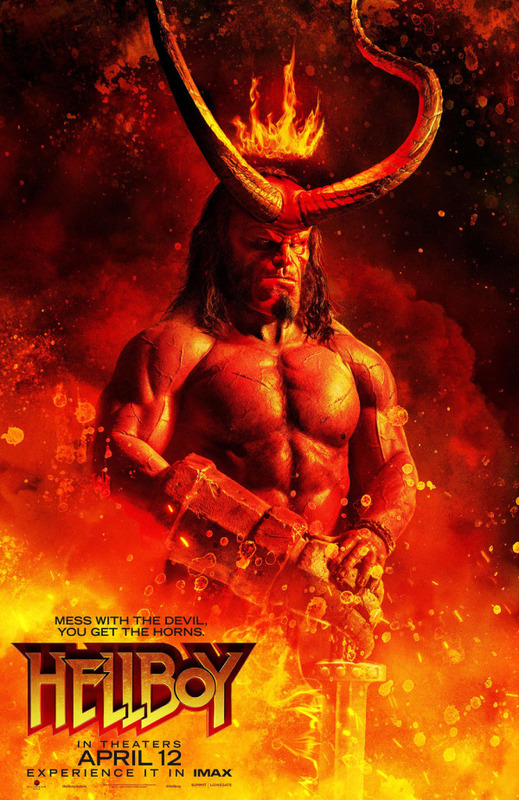 BY DAN TABOR FILM CRITIC Hellboy is an odd sequel/reboot mashup that simultaneously ties up the loose narrative threads left behind by Guillermo del Toro’s Hellboy (2004) and Hellboy II: The Golden Army (2008) while introducing a new cast and the fresh hell that will befall them. In this incarnation helmed by Neil Marshall (The Descent, Dog Soldiers), Hellboy (David Harbour) is assisted by spirit medium Alice Monaghan (Sasha Lane) and Bureau for Paranormal Research and Defense agent Ben Daimio (Daniel Dae Kim) as he attempts to stop a Gruagach, which is essentially a giant walking/talking warthog, from resurrecting Nimue, the Blood Queen (Milla Jovovich) who can give him the power to kill Hellboy. You see, during King Arthur’s reign Nimue wanted to create a world where man and monster co-existed, but Arthur betrayed her and used Excalibur to dismember her, scattering her still living remains throughout England. While just about everyone wants Hellboy dead, Nimue decides having Hellboy as her king and fulfilling his destiny as the beast that unleashes armageddon is in her best interests. It’s been over a decade since Hellboy II: The Golden Army and thanks to a power play by the comics creator Mike Mignola, who wanted to write the final installment of the trilogy; both Guillermo del Toro and Ron Pearlman exited the film in early development. Losing del Toro’s brilliant-bordering-on-fetishistic curation of the franchise leaves us with a film that lacks the power and vision of its predecessors. On top of that, the fairly pedestrian prosthetics and creature designs restrict David Harbour’s ability to act or perform action scenes. As a result, Harbour’s take on Hellboy feels less like Ron Pearlman’s relatable everyman in a world of monsters that we’ve all come to know and love and more like someone who doesn’t really understand the character’s underlying motivation. Simply put the film is a hot mess of bad ideas and poor execution. A decade ago a film like this might have been championed by horror geeks on the strength of its heaping helpings of blood and gore, but that really doesn’t really serve a purpose here. Comparison’s to del Toro’s vividly imagined and gorgeously crafted films only highlights the sloppy editing, puzzling needle drops and thread bare CGI of this reboot. The fans deserved better. This entry was posted on Friday, April 12th, 2019	at 2:47 pm	and is filed under News	. Responses are currently closed, but you can trackback from your own site.